Despite a rain-delayed program at Saturday’s Harley-Davidson Atlanta Short Track presented by Hellbender Harley-Davidson (with racing resuming today at 1:00 pm ET), edge-of-your-seat qualifying sessions and intense heat-race action resulted in a thoroughly entertaining afternoon of competition on Dixie Speedway’s legendary red-clay oval. AFT Twins presented by Vance & Hines qualifying was shockingly close, with the top 18 riders all within a half-second of one another. Yamaha-mounted JD Beach topped the leaderboard, with the three Indian Scout FTR750s of Kenny Coolbeth, Henry Wiles and Johnny Lewis in tow. 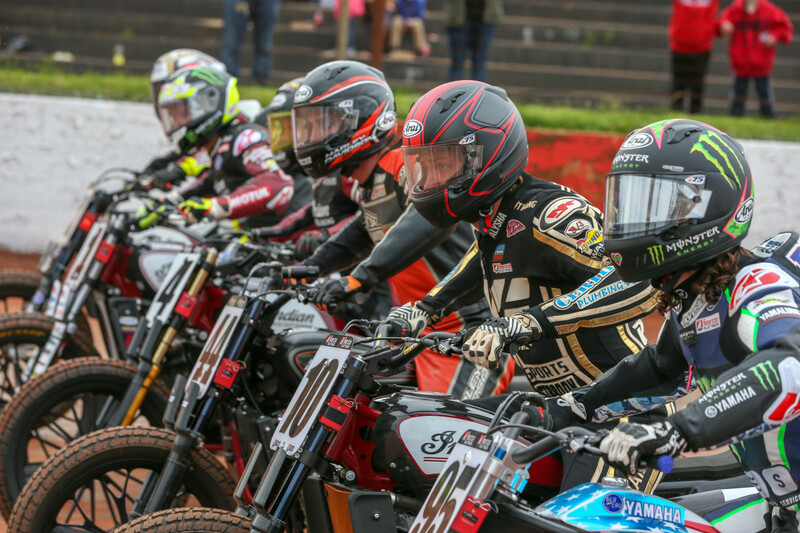 Reigning champ Jared Mees Indian teammate Bryan Smith were 13th and 10th, respectively, with Harley-Davidson-mounted Brandon Robinson 7th, Jarod Vanderkooi 18th and Sammy Halbert 23rd. AFT Singles qualifying was similarly tight, with the top dozen riders all within four-tenths of a second of one another. Spain’s Ferran Cardus grabbed the top spot, with Ryan Wells, Morgen Mischler and Kevin Stollings following. Other riders of note were Jake Lewis (6th), Shayna Texter (7th), Daytona-winner Dan Bromley 8th and reigning AFT Singles champion Kolby Carlile 10th. In AFT Twins heat number one, Lewis won convincingly, with 1.5 seconds between him and runner up Robinson and nearly two seconds over Mees. Fast qualifier Beach came home 6th. AFT Twins heat number two went to Coolbeth, with XR750-mounted Jeffrey Carver Jr. and Briar Bauman’s Kawasaki following a second and a second-and-a-half back, respectively. Indian-mounted Henry Wiles won heat number 3, with FTR-mounted Brad Baker and Yamaha-mounted Jake Johnson 3rd. Harley-Davidson factory rider Jarod Vanderkooi was fast, and actually led the heat briefly, but slowed with a mechanical and ending up 11th. Reigning champ Carlile grabbed the win in AFT Singles heat number one, but was hounded the entire race by Husqvarna-mounted Texter. Cardus came home third. Ryan Wells took heat number two, with Brandon Price and Cory Texter following. Cole Zababa brought his Kawasaki home first in heat number 3, with Mischler, Shane Narbonne and Jesse Janisch following. With so much speed and lap-time parity among competitors, the racing is sure to be hot and heavy today when racing resumes at Dixie Speedway, with practice sessions at noon and AFT Twins and AFT Singles semis beginning at 1:00 pm. Yesterday’s tickets will be honored, and tickets for today’s action have been discounted to the advanced-ticket general-admission price of $35. So come check out the action here at Dixie Speedway, or watch the live stream beginning at noon on FansChoice.tv.